Living the life of your dreams is often considered an unachievable goal (unless you have the secret roadmap to get there). 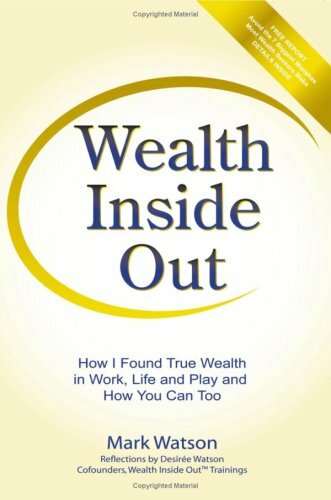 If you are looking for a more fulfilling way to create true wealth and happiness in every aspect of your life and business, Wealth Inside Out will show you the map. Author Mark Watson was living the American Dream in Carmel, California with his wife Desiree but instead of feeling happy and fulfilled, he became alarmingly aware of his discontent. Following what he thought was a heart attack, Mark developed a powerful methodology for utilizing ''inner'' conversations to rapidly gain deep insights for achieving financial, interpersonal, physical and spiritual wealth. In this groundbreaking book, he shares this methodology with you. Follow his riveting personal story to go beyond ordinary logic and find your own unique purpose in life, unlock your passions and discover how to create true success and happiness. ''The main reason most people struggle,'' Mark reveals ''is because they fail to get focused on a clear, passionate wealth direction and they do not learn how to go beyond their self-imposed limitations.'' Wealth Inside Out skillfully guides you step by step through the powerful six dimensions of wealth creation so that you can easily live the life of your dreams. About: In Wealth Inside Out, Mark Watson will show you how to:-Clarify your true wealth direction-Boost your wealth creation confidence-Achieve financial, interpersonal, physical and spiritual wealth Living the life of your dreams is often considered an unachievable goal (unless you have the secret roadmap to get there).